In a previous post, we discussed Wellington Williams’s publication in 1854 of a (not so) new map of North Carolina, printed from the resurrected copper plates of the 1833 MacRae-Brazier map. Those plates had more lives than a cat. Their next reincarnation resulted in one of the strangest North Carolina maps ever published. That is the topic of this North Carolina Map Blog post. When I first saw this bizarre map of NC at the Library of Congress many years ago, I was overwhelmed by its size and the beautiful vignettes decorating the top and bottom borders. A careful inspection revealed that the main part of the map was printed from the 1833 MacRae-Brazier copper plates, with minor alterations from the Wellington Williams map published in 1854-55 from those same plates. However, this map is much larger than the MacRae-Brazier or Williams maps. The decorative borders at the top and bottom, and most of the cartographic detail in Virginia, were added via lithography. I was determined to learn the identity and location of all the unlabeled buildings and homes. Only three of the 18 vignettes were labeled, two being in NC and one in Virginia. Surely the unlabeled vignettes were important homes and businesses in North Carolina, right? Imagine my surprise when magnification of this vignette in the top border revealed a stage coach with “Rondout & Kingston” on the coach. In the background, the lettering on the shaded side of the building: MANSION HOUSE. Curiously, the Mansion House vignette on the North Carolina map appears to be an earlier state than the one on the Ulster County map. 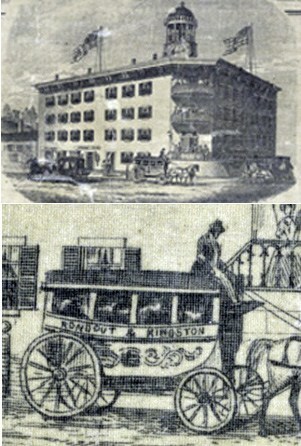 On the latter, “MANSION HOUSE” has been added to the left side of the building. On both, the American flags contain only 9 stripes! This peculiar North Carolina map bears no date and no copyright, printer, or publisher imprints. My guess is the map was published by J.H. French of Philadelphia since his name is found on each of the New York county maps from which the “foreign” vignettes were borrowed. The copy of this map in the Geography & Map Division of the Library of Congress is the only known original. Stay tuned, map friends. The Minister Strikes Back is coming to a web browser near you in early August. Use the RSS or Email subscription links at the top of the sidebar on the home page to be notified of new blog posts. Comments, critique, and corrections are greatly appreciated; please use the comment box below. This entry was posted in 19th Century, Decorative Elements and tagged John MacRae, MacRae-Brazier, Robert H. B. Brazier, Samuel Pearce by crmaps. Bookmark the permalink. How is it possible that the map was printed from plates dating 1833 when Cleveland County had not official been created? Cleveland County was not created until 1841 from territory of Lincoln and Rutherford counties. Or am I just reading your description incorrectly? Plates from 1833 but other parts from late 1850’s….by main part I assumed you meant the map and not the decorative parts. Thank you for your inquiry and for visiting the North Carolina Map Blog. The MacRae-Brazier map of 1833 was printed from 6 (I think) engraved copper plates. The individual sheets of paper printed from each plate would then be joined together to make the whole map. Afterwards, those copper plates lay dormant for 9 years until they were sold at auction in 1842. The purchaser apparently allowed them to lay dormant for another 10 years until sold at auction in 1852. The new owner, Wellington Williams, revised/re-engraved the plates to show counties that had been created since 1833. His 1854 map was printed from those revised plates. In approximately 1858, those same plates, again with minor re-engraving, were used to print the strange map that is the subject of this particular blog post. To the best of my knowledge, the printer used the copper plates for the main part of the map, and lithography to print all parts of the map that aren’t part of the “original” map. I hope this makes sense and, more importantly, isn’t too terribly inaccurate. Tony Campbell, former Map Librarian at the British Library, covers the topic of revised plates in great detail on his map history web site.